A single male hen harrier is responsible for both of the nests and he is currently taking food regularly to them. Bowland used to be known as England’s last remaining stronghold for breeding hen harriers. But, until this year, hen harriers hadn’t bred successfully there since 2015 when a single chick fledged. 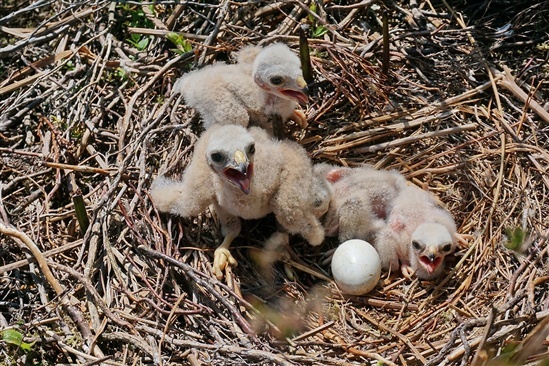 We now hope that the arrival of these eight chicks may mark a reversal in the fortunes for the hen harrier in Bowland. It’s a nerve-wracking time for all involved in protecting these birds, especially for the team that have been constantly monitoring the birds since they arrived on the estate in April. The male hen harrier is doing a fantastic job of keeping the chicks in both nests well fed and we’re doing all that we can to ensure that they fledge safely.